The team at Signature Smiles believes that all patients should be given the chance to smile with improved health and renewed confidence. That's why we take great pride in offering advanced restorative dentistry treatments in Woodinville, always focused on beauty as well as total wellness. Gum disease remains one of the most common problems we treat on a day-to-day basis. Many patients are surprised to learn that gum disease can cause tooth loss. Let's take a moment to explain. 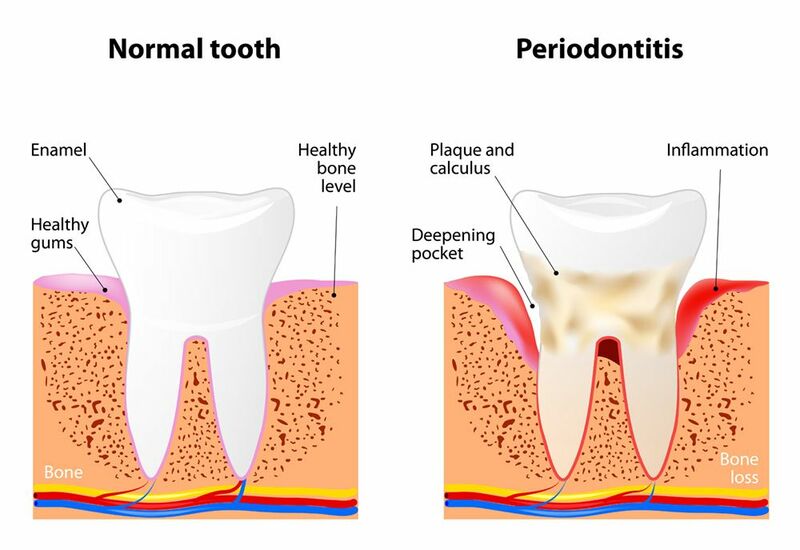 Also known as periodontal disease, gum disease refers to an inflammation of the gum tissue when it's infected by oral bacteria. This is the same bacteria that is responsible for tooth decay and bad breath. If not treated in a timely fashion, gum disease can cause many serious dental health problems. It's always best to treat gum disease during its earliest stages. If you notice issues with bleeding gums, irritated gums, chronic bad breath, sore gums, and gum discoloration, be sure to visit a dentist as soon as possible. There are a few ways that serious gum disease can lead to the loss of teeth. Tooth Decay Below the Gumline – One of the symptoms of advanced gum disease is gum recession, which means the loss of gum tissue and the exposure of more of a tooth's root structure. This makes it possible for gum disease to occur below the gumline, which is harder to treat and can potentially lead to much weaker teeth prone to breaks, major damage, and falling out. Root Canal Infections – Serious tooth decay linked to gum disease could make root canal infections more likely. Serious root canal infections may necessitate the extraction of a tooth to prevent spread of infection. Loosening of the Teeth – When the gum tissue is seriously inflamed, it loses its ability to support the teeth properly. In some cases, the loss of gum tissue can lead to wiggly or loose teeth. Loose teeth are more likely to fall out. Changes in Dental Alignment – In addition to teeth becoming loose, it's possible for teeth to shift position as a result of the loss of gum tissue. These changes in optimal position mean that the tooth is poorly secured by the gum tissue and may also have problems with how they are anchored by the jawbone, making tooth loss more likely. Smokers are more likely to lose teeth than non-smokers, and there's a good reason why. As it turns out, smokers are more likely to experience gum disease and gum recession, which means a greater chance of loose teeth, tooth decay, infection, and so forth. This is just another compelling reason to quit smoking. The most common treatments for gum disease with involve antiseptic and antibacterial medications that can get the infection under control. Soft tissue augmentation may be considered to help rebuild gum tissue that was lost as a result of gum recession. When teeth are missing, the ideal treatments are often dental bridges and dentures. In some cases, the use of dental implants may be considered. Dental implants are artificial tooth roots that help support dental appliances with a stability comparable to natural tooth roots. To learn more about gum disease, tooth loss, and your many options available for improving dental health and wellness, be sure to contact our cosmetic and restorative dentistry practice today. The team at Signature Smiles will work with you to ensure that your smile is as healthy as possible.